We share your passion for Frank Lloyd Wright’s work and principles, and we’re dedicated to helping you find the most effective way to invest in advancing our mission and vision. With your donation to our Annual Fund, you are helping to inspire people of all ages through our world-class STEAM (science, technology, engineering, arts, and math) education programs, challenging students to understand and embrace creative expression and innovation in their own lives. If you’ve visited Taliesin in Wisconsin, you witnessed the enchantment of the Birdwalk as it seemingly defies gravity to extend the house into the trees. 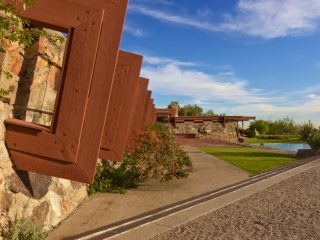 At Taliesin West in Arizona, you’ve experienced the illusion of the buildings disappearing into the surrounding desert landscape, as if they had always been there. Your support helps us preserve and maintain these masterpieces for future generations to be awed by their magic. Your donation to our Annual Fund helps make Frank Lloyd Wright’s work and principles available to more audiences around the world, inspiring generations of critical thinkers and creative problem solvers by preserving Wright’s work, expanding our education team, and encouraging innovation. Join a community of members who generously commit to providing stable financial support for the Frank Lloyd Wright Foundation through a pledge to make unrestricted gifts of no less than $1,000 each year for five years or more. Usonian Society members are invited to attend exclusive events and engagement opportunities at Frank Lloyd Wright’s homes, Taliesin and Taliesin West, as well as other Wright sites across the country. Frank Lloyd Wright continues to inspire the world to build better and live better, long after his passing. By including the Frank Lloyd Wright Foundation in your planned giving, you can leave a legacy of support.